Many often-repeated ‘facts’ about Australian Sarus Cranes are still interesting hypotheses waiting to be investigated: some are apparently myths waiting to die, despite evidence to the contrary. In Knowledge Gaps 1, Ozcranes looks at taxonomic issues: are there sub-species of Sarus Crane? are Brolga and Sarus Crane each other's closest relative? do northern and southern Brolgas interbreed? Plus, a comment on recent debates about Antigone as the genus for Australian cranes. The 1992 baseline for Brolga and Sarus knowledge was HANZAB2. Some gaps are now the subject of major studies while some are still unexplored, more in Knowledge Gaps 2». Brolga & Sarus – closest relatives? 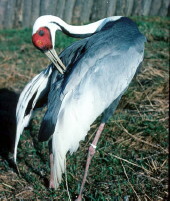 In 1966 the ‘first’ Australian Sarus were classified as the Eastern Sarus Crane (southeast Asian) sub-species, sharpii. But in 1988 a new Australian sub-species gillae (sometimes spelt gilliae) was described in somewhat controversial circumstances in Canberra Bird Notes (13:4, Dec. 1988, pp.119-122), citing smaller size (using wing size as the example) and different plumage on ears and upper throat. Studies first on mitochondrial DNA, then nuclear DNA, do not support distinguishing sub-species. The differences between all Sarus are regarded as clinal (gradual and continual across its range) although work is continuing on different forms. Recent analysis suggests that the Myanmar-China population is genetically different from Eastern Sarus, and material from the extinct Philippines population in included in a current PhD study». The formal position in Australia still appears to be based on the 1988 publication. But given the complete reproductive isolation of Australian Sarus, some argue this gives the best focus for conservation efforts. It's also suggested that Australian Sarus may be a separate species ‘in development’ due to the small population, isolation and potential hybridisation with Brolgas. Gill, HB. 1969. First record of the Sarus Crane in Australia. Emu 69: 49-52. Schodde, R, Blackman, JG, & Haffenden, AT. 1988. New subspecies of Australian Birds. Canberra Bird Notes 13:4, pp. 119-122. Download from Canberra Birds, scroll down to Vol 13 No 4, December 1988. Krajewski, C & Wood, C. 1995. Mitochondrial DNA relationships within the Sarus Crane species group (Gruiformes: Gruidae). Emu 95, pp. 99-105. Wood, C & Krajewski, C. 1996. Mitochondrial DNA sequence variation among the subspecies of Sarus Crane (Grus antigone). Auk 113, pp. 655-663. Download from SORA. Jones, KL. 2005. Genetic variation and structure in cranes: A comparison among species. PhD Dissertation. Available from the ICF. Jones, KL, Barzen, JA & Ashley, MV. 2005. Geographical partitioning of microsatellite variation in the sarus crane. Animal Conservation 8, pp. 1-8. Download (abstract only) from here. Based on plumage, morphometrics (measurements) and unison calls, Brolgas and Sarus Cranes were long assumed to be sister species – each other's closest relatives. 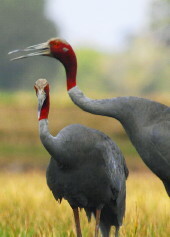 Genetic studies show that both are closely related to the White-naped Crane Grus vipio, but differ as to whether Sarus Crane is closer to Brolga, or White-naped. 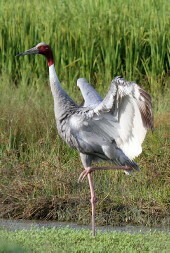 The Brolga, White-naped and Sarus Crane are also, less directly, closely related to the Sandhill Crane of north America. Recently J del Hoyo et al., for BirdLife International, placed all four species into the genus Antigone, separate from all other Grus cranes. The new HBW/BL list rationale overall, has been defended (Burfield et al. 2017) on a philosophical basis relating taxonomy to conservation. With the change from Grus to Antigone for these four crane species, there is no genetic evidence and the International Crane Foundation has not accepted the change. For now, Ozcranes is retaining Grus for general purposes. However, much of the literature will probably go with the change so many titles, abstracts etc. for future formal papers will use Antigone. Krajewski, C. 1989. Phylogenetic relationships among cranes (Gruiformes: Gruidae) based on DNA hybridization. Auk 106, pp. 603-618. Download from SORA. Krajewski, C & Fetzner, JW Jr. 1994. Phylogeny of cranes (Gruiformes: Gruidae) based on cytochrome-b DNA sequences. Auk 111, pp. 351-365. Download from SORA. Krajewski, C. et al. 2010. Complete mitochondrial genome sequences and the phylogeny of cranes (Gruiformes: Gruidae). Auk 127(2): 440-452.
del Hoyo, J, Collar, NJ, Christie, DA, Elliott, A & Fishpool, LDC. 2014. HBW & BirdLife International Illustrated Checklist of the Birds of the World. Lynx Edicions BirdLife International, Barcelona, Spain and Cambridge, UK. IJ Burfield, SH Butchart & NJ Collar. 2017. BirdLife, conservation and taxonomy. Bird Conservation International 27:1 pp 1-5. Apart from the Brolga-Sarus hybrid question (see Gaps 2»), there have long been queries about Australia's Brolga population. Are northern and southern Brolgas effectively, separate breeding populations? Is there any indication (as was once believed) they are separate sub-species? These questions are now being addressed by the Brolga Genetics Project, a joint study between Nature Glenelg Trust and Melbourne University. To read a recent newlsetter report, and download a peer-reviewed preliminary paper on the findings, visit Nature Glenelg Trust. Miller, A (2016). The development of microsatellite loci through next generation sequencing, and a preliminary assessment of population genetic structure for the iconic Australian crane, Brolga (Antigone rubicunda). Nature Glenelg Trust, Warrnambool, Victoria. ↓ Indian Sarus Crane stretching wing; (KS Gopi Sundar). ↑ White-naped Crane, close relative of Brolga and Sarus Crane (International Crane Foundation). 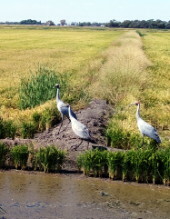 ↑ Brolgas in rice field, Riverina NSW, courtesy Peter Shepppard.